I really like this color! I love yellows and this one is a bright, lemony frost with faint orange flash. 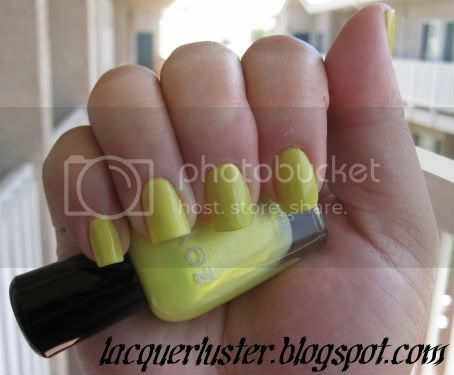 It looks more like a chartreuse in the bottle but the greenish tint doesn't show up on the nail. As much as I love the color, the formula left something to be desired. Application was streaky and even after three coats there's still a bit of visible nail line. It also took quite a while to dry. Still, it's such a sunny, happy color that I can't resist!